Delores Dare, 89, passed away on June 9, 2018 at Iowa Methodist Medical Center in Des Moines. She was born in Des Moines on July 27, 1928, to Everett and Evelyn (Hoisington) Scovel. Delores retired from the Bob Allen Company after many years of service. She had a gentle spirit and loved serving the Lord. 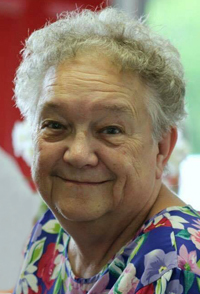 Delores enjoyed going to church and regularly attended various churches in the Des Moines area. She also enjoyed reading cookbooks and made amazing chicken and noodles. Delores is survived by her children, Norman (Jackie) Dare, Janet (Chris) Bishop, Ronnie Dare and Jenny (Larry) Slight; 12 grandchildren; 23 great-grandchildren; sister-in-law, Sue Scovel; special cousin, Phyllis Hoisington; many nieces, nephews, extended family and beloved friends. She was preceded in death by her husband, Floyd; parents; siblings, Everett, Jim, Shirley and infant sister Myrtle; and great-granddaughter, Maddie Jo. Visitation will be held on Thursday, June 14, 2018 from 5 to 7 p.m. at Hamilton’s Southtown Funeral Home, 5400 SW 9th Street. Funeral services will be held at 10 a.m. Friday, June 15th at the funeral home followed by burial at Chapel Hill Cemetery. Memorial contributions may be directed to her family in loving memory of Delores.